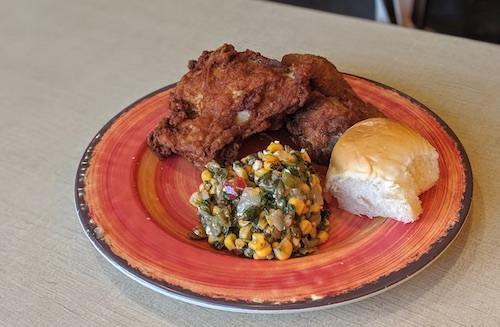 The famous Guatemalan fried chicken chain has landed in New York City in two accessible locations [UPDATE: The chain is adding locations and there are at least three more in Queens and Brooklyn now]. Both serve the same menu, and both are true to their home country's delicious restaurant. There are many things that set this fast food chain above its American counterparts. Firstly, they treat you well, are friendly, and do not seem inconvenienced when you place an order. It's also nice to eat off of real plates and create less waste. Fries are not the obligatory choice of any combo meal, the list of choices is at least 10, and includes tostones, sweet plantains, Campero's special beans, and many more. All for the price of a combo meal at McDonald's or Burger King, where you could never recognize actual chicken meat. 3 Piece meal with corn salad ($8). They used to provide hot tortillas with the meals, but have switched to a dinner roll as default now at least here in the states. The fried chicken they are famous for has remained remarkably true to the same quality over the years, and brings back good memories of the first time I had this in Guatemala City on new year's eve back in 2005. In all its greasy glory, it is some of the finest fried chicken available. It is thoroughly soaked in the hot grease, inside and out, but that is the beauty of it, full of flavor and never dry. There is a salty, tangy, citrus marinade going on... their spices make the skin and meat both explode with great flavor. 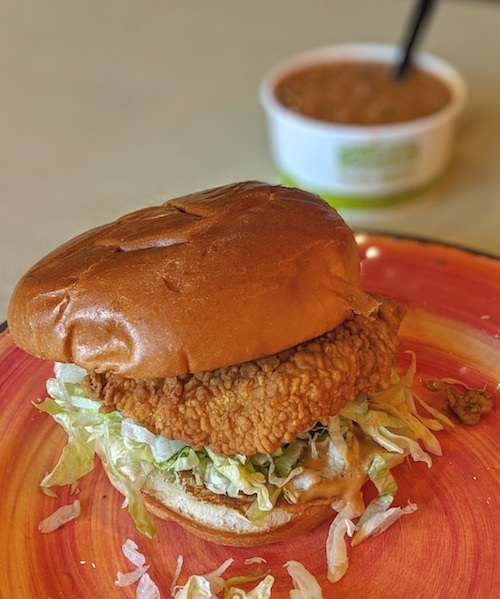 Also worth trying is the extra crunchy chicken sandwich, shown below as a meal with Campero beans for $7.50.